With a constantly evolving business climate, encountering change is the new normal. Organizations that embrace and practice agility are proven to be more effective in dealing with change. Key to fostering agility is continuous learning and development. Learning is not an event-based occurrence where one-time training can satisfy skill gaps; learning opportunities need to be accessible, targeted, and continuous. With a strong learning culture that aligns with business objectives, companies are better able to embrace an agile mindset, and with increased agility, performance will improve and the overall business impact will increase. 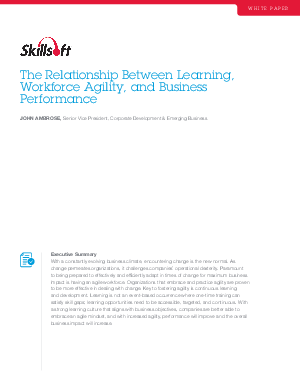 Download this white paper for a deeper look into the relationship between learning, workforce agility, and business performance.